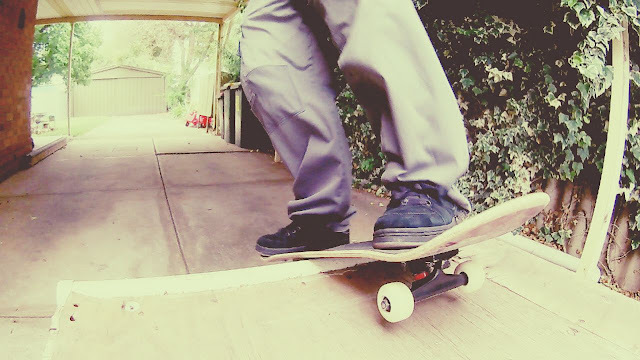 Rock-to-Fakies, the act of riding your skateboard up a ramp, hanging half your board over the lip, then lifting your board back into the ramp, and riding out backwards, is one of the most basic ramp tricks. Yet I can't do them anymore. At one time I could, without giving it any thought - even on my home 5' high mini ramp with an extra foot of vert extension added to the top of the transition. But as my skating got less, and skateboard spots with ramps diminished through the mid to late 1990s, I got out of practice. I did have a two foot tall, driveway mini, quarter pipe (with coping) I used to practice my mini ramp tricks on. Then one fateful day (I say that because this is scarred into my brain) I tried a rock-to-fakie and the tail of my skateboard dug into the pave stones at the base of the ramp as I came down, throwing me, hard, back into the ground. To be clear, I didn't hurt myself, anymore than you can imagine from such a fall. Bit of a bruised leg, maybe a sore wrist or arm from impact. Nothing broken. I've easily fallen worse, many times before then. However, since then, the thought of my tail digging in and throwing me off the board on a rock-to-fakie, plays on my mind with every single attempt. It was not to be. Watch the video below for how hard I tried. I'll get them another day because I'm determined to keep trying. It just wasn't going to happen in one session.